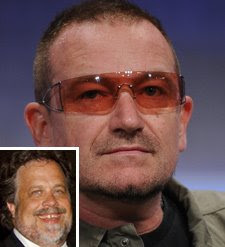 BONO PRO BONO Bono, Rosenthal (inset) (Photo: Getty Images) Like Vanity Fair editor Graydon Carter before him, New York Times editorial page editor Andrew Rosenthal sees something special in a certain teensy Gaelic man who refuses to remove his sunglasses. That's right, the Timesman announced last night his first acquisition for the paper's Op-Ed pages for 2009: Bono. Yep, Bono. The activist-creator of Zoo TV will pen between six and ten pieces for the Grey Lady next year, Rosenthal told students Wednesday night at Columbia's School of Journalism. So might this new hire be taking the position of—or helping to off-set the damage done by—any especially right-leaning columnist currently under fire for his devotion to vice-presidential candidate Sarah Palin? Say, Bill Kristol, for example? Rosenthal dodged questions about Kristol, refusing to say if the Times would renew the right-wing columnist's contract when it expires in January, or who might replace him if he goes. Instead he cracked wise and affectionately of all his columnists. Kristol, for example can be "kooky," and in fact the whole staff, he noted wryly, is "incredibly easy to deal with and very humble." He took Maureen Dowd's infamous Latin column as a case in point: "I told her I thought it would be a little weird, and she did it anyway," but given that she's "the easiest and most pleasant edit of any writer I've worked with in my life," he let it slide. Of course, in belt-tightening times, it's important to note that the ink of the high-holy U2 crooner comes free of charge: "Nothing," said Rosenthal of Bono's pay rate, noting that the Irish millionaire will muse on Africa, poverty, and, importantly, the music of Frank Sinatra. And while Bono may seem an odd choice for such a contract, Rosenthal did mention his current obsession with learning the guitar, and even shuffled freshly downloaded riff tablature together with his lecture notes. And though Rosenthal didn't announce any other celeb contributors, he did allude to re-recruiting the pen of Queen guitarist Brian May, who just earned his doctorate in astrophysics, and expressed admiration for previous opinion writers Bruce Springsteen and Larry David. Of actual journalists, Rosenthal said he admired the work of the Atlantic's Megan McArdle and the National Review's Byron York. Which is all fine and well, but are there former contributors Rosenthal doesn't like? "Condoleezza Rice is a particularly bad op-ed writer." And Tom Wolfe tends to write very long. So no Rice, less than Wolfe, and more in the spirit of Bono. Given that the Times' opinion pages could be the most competitive 800 words in journalism, any other pointers on how to make sure a fledgling contributor's submission will get printed? "Take a position in support of any Republican you care to name," the editor joshed. But it's a fine line, he noted with a smile: "The problem with conservative columnists," said Rosenthal, "is that many of them lie in print."